Since the beginning of mankind the light has been source of fascination and curiosity. Galileo with his telescopes studied the light from distant planets and stars, changing our compression of the universe. Einstein’s work lead to the modern Laser, which is today a basic tool in Sciences, Medicine, and Engineering. Dirac discovered the quantum world within the light, source of the most advanced current and future technologies. The Millennium Institute for Research in Optics (MIRO) is dedicated to the study of fundamental questions such as: What is light? What are the properties of light? Can we control these properties? How does light interact with matter? Can we control this interaction? Can be the light the base of new applications and technologies? Applications of our research cover a wide range of subjects. Single photons can be employed to realize quantum key distribution for secure communications and to fundamental test of the quantum theory. Generation of twisted beams of light help to implement distortion-free open-path optical communications. 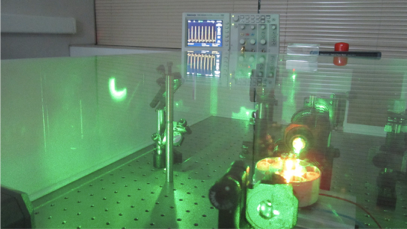 New source of light make possible accurate measurements beyond the standard limit. A network of laboratories endowed with state of the art equipment carries out challenging experiments, supporting and promoting generations of new young scientists at the frontier of the knowledge. Results of our research activities are published in the best scientific journals. Download the descriptive brief of this center in PDF format.